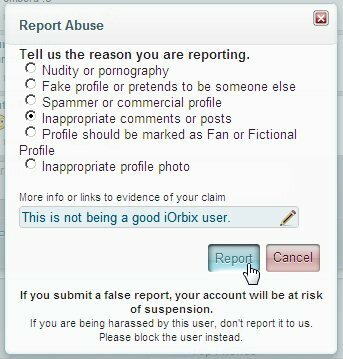 If someone is harassing you, you should report that user to iOrbix Staff. [b]It does NOT mean that we will suspend them as soon as we see the report. [/b] However, if we see that many people are reporting the same user, we may take some action. 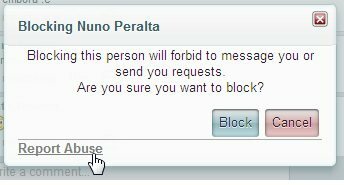 Bellow profile photo, you'll find a "Report/Block User". Please click on that link. A "Block User" window will appear. At the bottom of it, click on "Report Abuse". Then you can express the reason you are reporting them. However, [b]if you are just arguing with the user because of personal reasons, please do NOT report to iOrbix[/b]. We can do nothing to fix your personal issues. Only if the user is really abusing on a daily basis is a reason for you to report to iOrbix. So, if you simply don't want the user to contact you, please just block them. Now, the user won't be able to contact you anymore! Press [i]Unblock[/i], and both will be able to contact again.